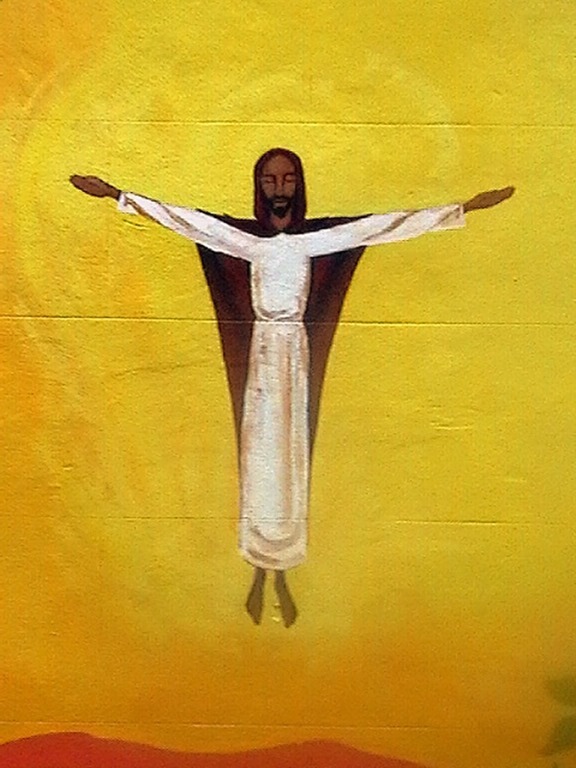 Thursday was Ascension Day, the day when Christians remember and celebrate the day when Jesus who had risen from the dead, ascended to heaven. Today I preached at Nelmes United Reformed Church in Hornchurch on the theme of Ascension Day. 44 He said to them, “This is what I told you while I was still with you: Everything must be fulfilled that is written about me in the Law of Moses, the Prophets and the Psalms.” 45 Then he opened their minds so they could understand the Scriptures. 46 He told them, “This is what is written: The Christ will suffer and rise from the dead on the third day, 47 and repentance and forgiveness of sins will be preached in his name to all nations, beginning at Jerusalem. 48 You are witnesses of these things. 49 I am going to send you what my Father has promised; but stay in the city until you have been clothed with power from on high.” 50 When he had led them out to the vicinity of Bethany, he lifted up his hands and blessed them. 51 While he was blessing them, he left them and was taken up into heaven. 52 Then they worshipped him and returned to Jerusalem with great joy. 53 And they stayed continually at the temple, praising God. If you had been one of Jesus’ disciples, you certainly would have lived in interesting times. ▸ The betrayal of Jesus by Judas Iscariot and then the sham trial by the Jewish authorities who with the evidence before them could not bring themselves to see that Jesus was the Messiah, the one for whom they had been waiting. ▸ The failure for political reasons of Pilate, the roman Governor, to release an innocent man. ▸ That amazing Easter Sunday when Jesus rose from the dead and appeared to many people. And now here on what was called Ascension Day we find Jesus with his disciples in the vicinity of Bethany and he is leaving them. What was it that had filled these people full of joy? These early believers had come to understand so much about Jesus’ mission after the resurrection, as we heard in our passage where it says that Jesus opened their minds so that they could understand the scriptures. I suspect that this was very much like the discussion that Jesus had with the two disciples on the Road to Emmaus as recorded earlier in Luke 24:13 – 35 . And now they are relying on his promises. Not only is the Holy Spirit called the Counsellor but also he is the Comforter. Some people think of a comforter as someone who will wrap you up and look after you when you are feeling down. Sometimes we refer to a blanket or a quilt as a comforter. Yet the word comforter has another, older meaning. In a panel of the Bayeux tapestry William the Conqueror is shown brandishing his sword around his somewhat reluctant soldiers to encourage them to get on with the battle. The panel is entitled “William comforts his soldiers”! So the Holy Spirit is sent to each and every believer to be an encourager as well as to reveal the truth of God to us. He gives us good counsel as well as spiritual gifts to help us and other Christians grow in faith both individually and corporately. I am sure that many of you can testify to how the Holy Spirit directs us to a passage of scripture that suddenly comes alive as we read it, or how he prompts us to visit someone or phone them just at the moment they need someone to talk to or to pray with. 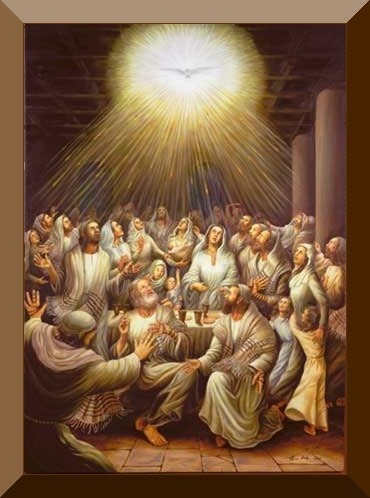 Without the Holy Spirit how could we fulfil the great commandment in Matthew 28:19 & 20: ” Therefore go and make disciples of all nations, baptizing them in the name of the Father and of the Son and of the Holy Spirit, and teaching them to obey everything I have commanded you.” We could never do it on our own. Also without the Holy Spirit to lead us and guide us and indeed remind us that we are God’s children, we could end up lost and forlorn rather like Paddington Bear with a label round our neck saying “please look after this Christian”. It is good for a moment to consider what Jesus is doing back in heaven. At present not everyone acknowledges Jesus Christ as Lord. Not everyone gives him the glory due to his name. But there will be a time when every man, woman and child will do so, some willingly and joyfully and others because they on judgement day are faced with the overwhelming evidence of Jesus the son of God. Even atheists and the devoted followers of ISIS will be on their knees before Jesus. Of course now many people who follow other beliefs and philosophies make passing reference to Jesus as a good man or a miracle worker or a prophet. But they do not acknowledge the truth of Jesus the son of God. Jesus says in John 5:23 “He who does not honour the Son does not honour the Father, who sent him.” Its as simple as that. If you do not give Jesus the son of God the recognition he deserves, you are not honouring God. 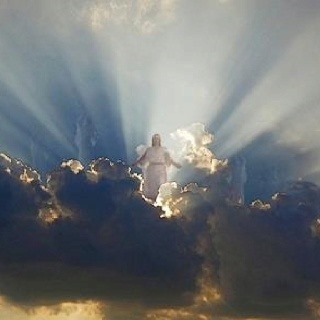 And following on from that thought of Jesus having the name above all names, Jesus went back to heaven to be crowned. 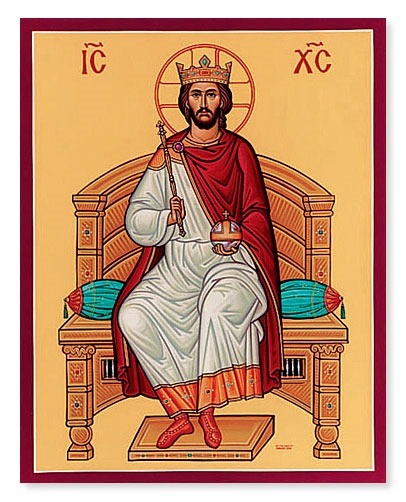 The Bible calls him the King of Kings and Lord of Lords. Some folk think that Jesus just sits on a throne next to God accepting the worship that’s rightly due to him. He has earnt his rest by what he did on earth. However the Bible tells us that Jesus is not taking it easy. Melchizedek is mentioned in Genesis 14 as a priest of the most high God and King of Salem. He was clearly an important man as we read in Genesis that Abraham gives him an offering. In those times the least important man gave the more important man an offering. Jesus is our great High Priest in the order of Melchizedek. He has given the one perfect sacrifice for the sins of mankind which has been accepted by God. So no further sacrifices are ever needed, hence why the Jewish line of high Priests ended when the temple was destroyed. In addition to the sacrifice of himself that Jesus offered, he fulfils another priestly function – he intercedes for us. Jesus prays to God the Father for us. Being human he knows our weaknesses and he knows what it is to be tempted. He like us faced trials and temptations. He knows how it is. So Jesus, having been restored to all his glory is occupied in heaven ruling over creation and sustaining it and also he is busy interceding with our heavenly Father on our behalf. They know that Jesus going back to heaven isn’t the last they will see of him. Its farewell not goodbye. They will be with him again. That is a promise for all who put their faith in Jesus. He has conquered death and broken the power of sin in our lives. So we can be certain that if we put our faith in him, we shall be with him in eternity in Heaven, his Father’s house. On Thursday night Gaynor and I were at the Albert Hall to see Eric Clapton in concert. One of the songs he played was called “Can’t find my way home”. As I listened to the song I realised that it is a song a Christian cannot truthfully sing as we don’t have to find our way because Jesus is our way home, our way to God our Heavenly Father. In early 1942 General Douglas MacArthur was forced to leave his beloved Philippines as the Japanese forces over run the country. In his broadcast to the Filipinos he used this famous phrase ” I shall return”. Indeed he did return after a great deal of fighting and bloodshed. The difference between General MacArthur and Jesus is that Jesus left the earth as a conqueror. He had defeated death and the devil and broke the power of sin. He was victorious and his eventual return is a certainty whereas to be honest MacArthur’s “I shall return” was a hope. So Jesus will return but until that day we all have a job to do, and he has given us the Holy Spirit to enable and empower us to do that job which is to spread the good news to the four corners of the world and make disciples of all nations. Amen. This entry was posted in Talks and tagged Ascension, cross, God, good news, High Priest, Holy Spirit, Jesus, Melchizedek, sacrifice. Bookmark the permalink.